Spalled or spalling concrete has become an increasing problem, causing many contractors to begin searching for economical solutions. The reason for such occurrences may not be one particular item. Whether it was the slump of the concrete, a bad mix, improper screening and floating or a direct cause of deicing agents penetrating the concrete surface, spalling concrete is an eyesore and an issue that needs attention. With time, labor and material costs factoring into a concrete contractors mindset, realistic solutions which will resolve the situation and stand up to the conditions that originally caused the concrete to spall may be few and far in between. Our team took the time to speak with many contractors and understand their concerns in repairing the spalled concrete versus tearing the damaged slab out and pouring a new slab. In doing so we noticed a technique that addressed the contractors fears while delivering a sound and consistent repair and resurfacing solution to spalled concrete. Below are the top concerns that guided the development of their technique and the products they used for the application. How do you remove the loose spalling/spalled concrete? Most contractors will begin with an aggressive pressure washing or scarifying of the concrete surface. The goal of this process is to remove all lose concrete and create a sound surface. A turbo tip and a pressure washer of 3,500 psi or greater will generally be sufficient. How do you control or stop the current spalled damage to the concrete? Prevention of further damage to the spalling concrete is not an exact science. A sound option for prevention is the use of a Lithium densifier. The use of a Lithium Densifier will harden and increase the surface PSI and increase the durability. Use of conventional sodium or potassium sodium hardeners are not recommended as they may leave a high concentration of salts deposited on the surface of the concrete and may add to surface cracks. What material should we patch the spalled concrete areas with? With Freeze-Thaw an important part of the equation in deciding upon a material, Flash Patch is an ideal material choice that delivers a hard surface while giving you a chemical and mechanical bond to the concrete slab. In addition to those attributes this material allows you to patch all areas of the spalled concrete surface. Once applied your down time is a matter of 15-30 minutes, then you can begin applying your resurfacing topcoat material. 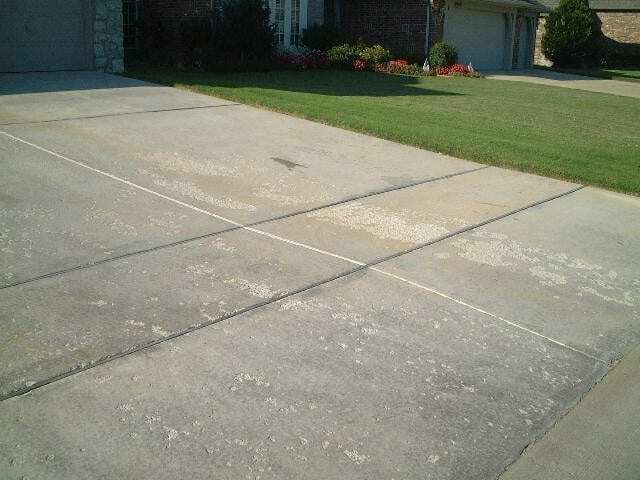 Flash Patch is a single component (just add water), cement based concrete patching compound. With a quick set time, this product allows you to stay on the job site and delivers a compressive strength of over 6200 PSI. What can be done to delay or prevent deicing chemicals from affecting the new surface? Use of a solvent acrylic sealer provides deep penetration capabilities and the ability to minimize the slick surface texture. A product with 20% solids delivers the needed attributes which aids in repelling deicing agents and preserving the renewed surface from Spalling and other causes which deteriorate and the surface. A common question after application is how often should we reapply sealer? We would love to give a solid time table like 2-5 years but the simple fact is many factors come into play that decrease the life span of a sealer. How can you tell if your sealant is weakening? Try a water test. When water is applied to the surface it should bead up as water would on a waxed surface. If the water beads your protection is still sound. With regards to the sheen or gloss look of the surface, that is determined by the individual and their desired look. If you would like to see an instructional video on the concrete repair and resurfacing system click here.